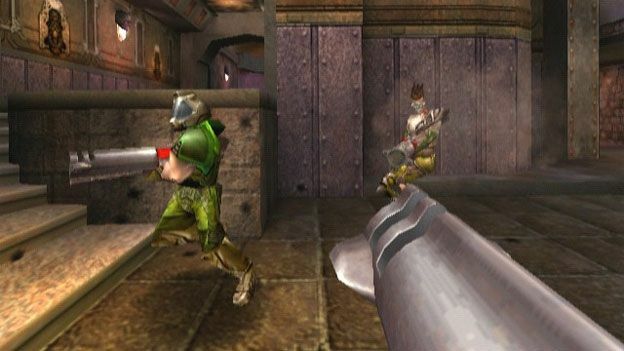 Reddit has picked up on a story of a Quake 3 Arena player who reportedly left his bots running on a server for four years and when he returned found the bots had 'learnt' peace. As some will remember, Quake 3 Arena's bots were coded as 'smart AI' in that they would learn as you played, adapting to find the best way to both survive and also kill the other players around it. It would appear as though after four years they surmised that ultimately, their only way to survive was to create their own version of Utopia. By not killing each other they would guarantee their survival. According to the poster each bot's AI file log came in at a staggering 512MB, huge considering the game itself was released in 1999. Sadly, and as is the case in so many of these situations, man got involved with the player deciding to return to his server and see what would happen if he shot one of them. Unsurprisingly, they reacted fairly badly to this intrusion with all of them instantly heading for a weapon, dispatching him and then crashing the server. Whilst the player in question argued his case well here it would appear as though many are unconvinced by this tale, we're reserving judgement but whatever the outcome at least it makes for a good tale.